Pactamycin and Pactamycate belong to the group of aminocyclopentitol-containing natural products. Both exhibit strong cytotoxic effects against Gram-positive and –negative bacteria in vivo and in vitro respectively. They contain one of the most densely functionalized aminocyclopentitol ring systems found in nature. Despite two approaches towards the construction of the cyclopentitol core, no total synthesis has been described to date. 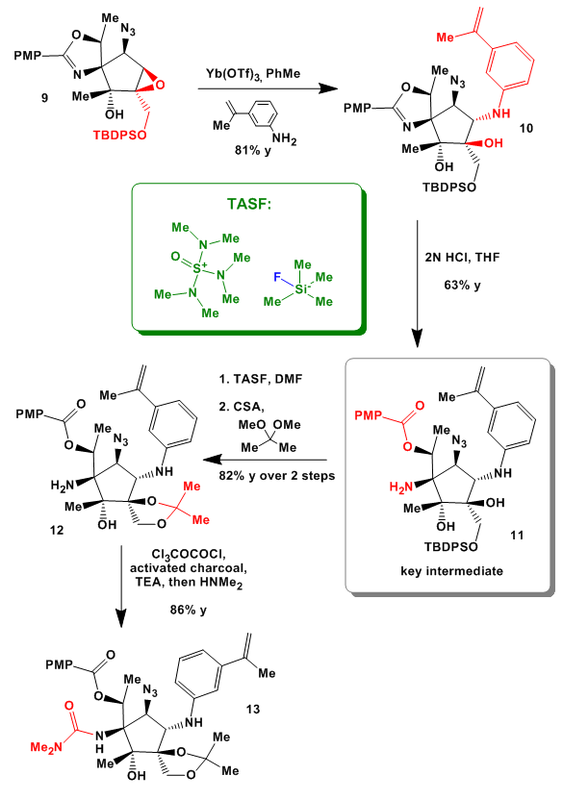 This review deals with the total synthesis recently published by the Hanessian group which includes some really interesting chemistry to decorate the cyclic core. 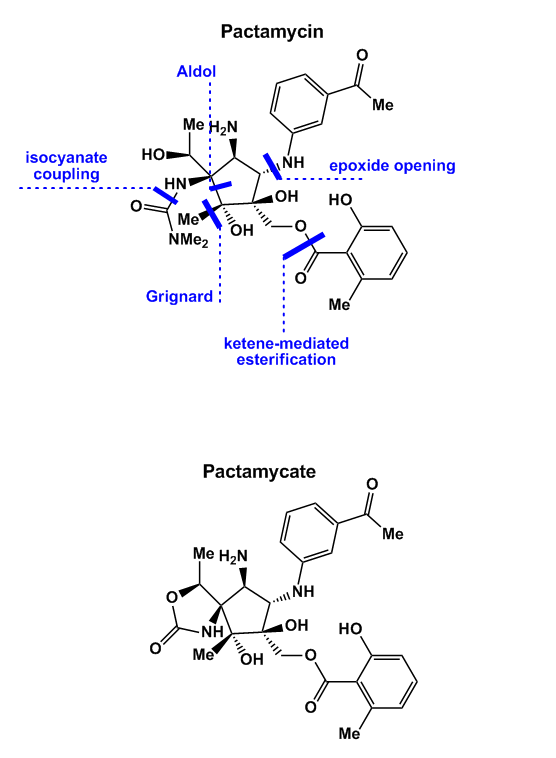 As can be seen from this scheme the only difference between pactamycin and pactamycate is the acyclic and cyclic carbamate motif respectively. The synthesis starts right off with L-threonine which was esterified, reacted with PMBzCl, and dehydrated to give oxazoline 2. During this step the configuration of the hydroxy group was inverted. Deprotonation and aldol reaction with the acrolein derivative shown was followed by TES protection of the resulting aldol. Ester 3 was then reduced with DiBAl-H, the resulting aldehyde alkylated, and oxidized again under Swern-conditions to furnish 4. 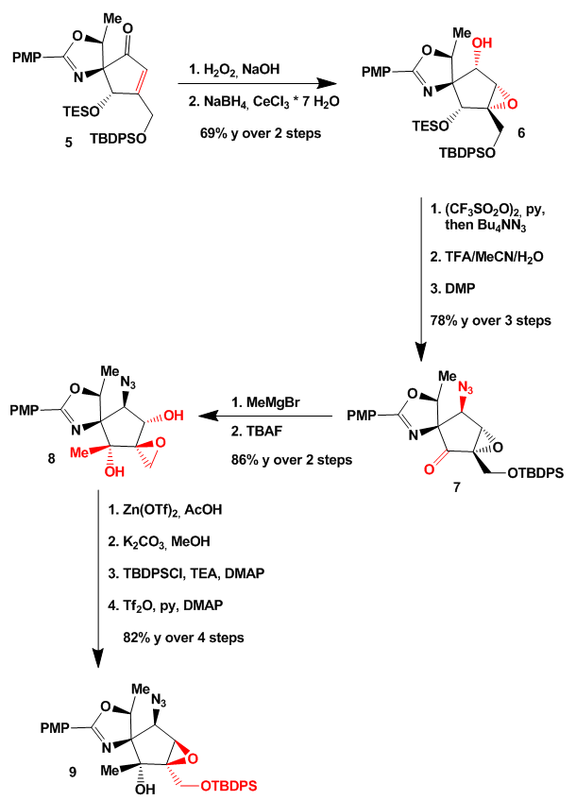 Ozonolysis of the exo-methylene group, Mukaiyama-type aldol reaction, and dehydration with diphosgene resulted in the formation of 5. Next, reaction of the unsaturated ketone with peroxide in alkali solution and subsequent Luche reduction of the carbonyl gave epoxy-alcohol 6. SN2 displacement of the hydroxy group with azide, selective TES cleavage, and DMP-oxidation of the free alcohol produced ketone 7. Grignard reaction with methyl magnesium bromide and TBAF mediated Payne rearrangement furnished epoxide 8. Opening of the epoxide was accomplished with zinc triflate in acetic acid. The resulting acetate was saponificated, the primary alcohol protected as the TBDPS ether, the secondary alcohol triflated, and converted into another epoxide through an SN2 displacement by the remaining tertiary alcohol to give at last 9. The epoxide was then opened with the aniline derivative shown catalyzed by ytterbium triflate followed by opening of the oxazoline ring with HCl to give aminoalcohol 11. This compound is the key intermediate on the way to pactamycin and pactamycate respectively. Cleavage of the TBDPS group with TASF and protection of the vicinal diol furnished acetonide 12 which was carbamoylated through in situ isocyanate formation to give dimethyl carbamate 13. To the end the PMBz group was reductively removed, the styrene double bond oxidized to the ketone and the acetonide cleaved off with TFA. 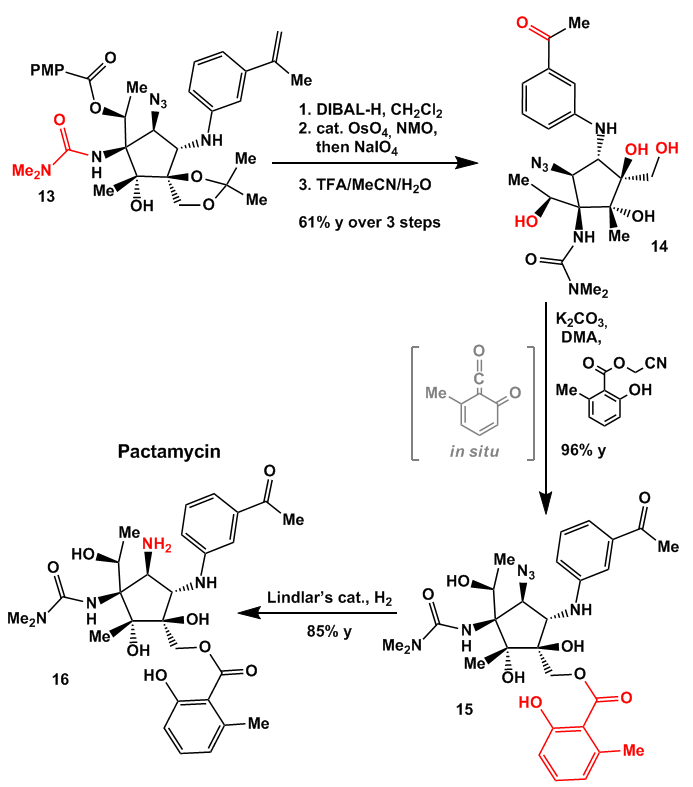 Selective esterification of the primary alcohol was accomplished through a ketene intermediate derived from the salicylic ester shown to give azidopactamycin which was reduced with Lindlar catalyst to give pactamycin 16. Starting from intermediate 11 the PMBz group was removed with DiBAl-H, the vicinal amino alcohol cyclized to the carbamate with diphosgene and the styrene double bond cleaved off to give 17. 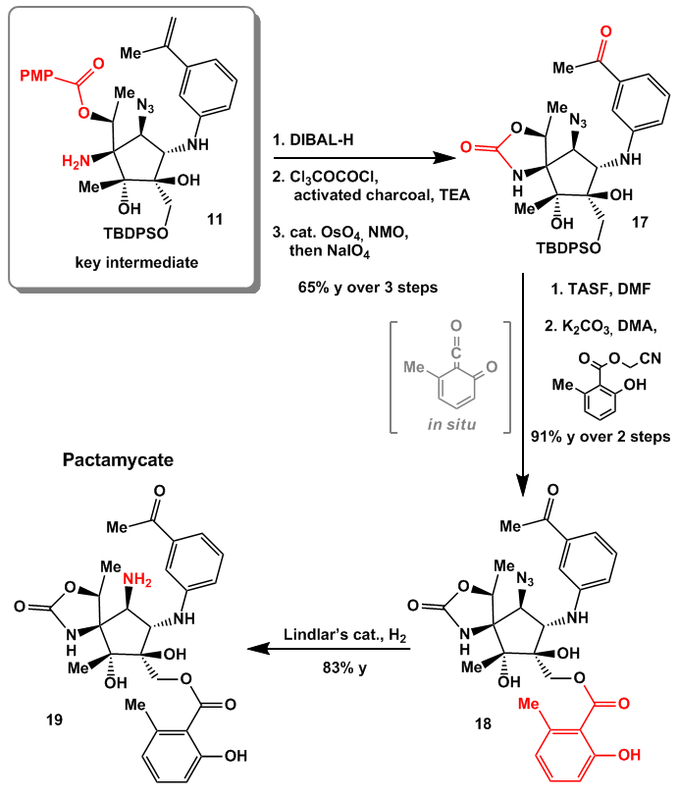 As before removal of the TBDPS group was accomplished with TASF, the primary alcohol esterified and the azide reduced to the amine to give pactamycate 19. Nice synthesis and as usual with the Hanessian group a pretty complicated task. 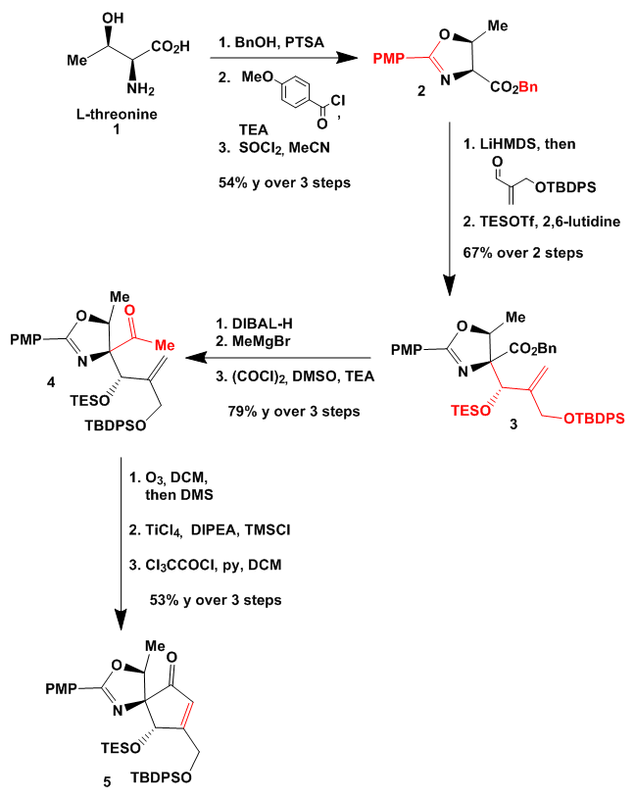 I really like their modular approach and the highly selective esterification strategy. And again special thanks to Bobby for proofreading my post in advance.